Great! I’m just in transit at the moment. I’ll check it out when I get back home next week. Great idea for a widget, I tried it on a test server (with a heavily modified Discourse) but I had a failed to bootstrap, is it working on yours still ? The profile widget worked well during install. @jez Thanks again for making a widget that works with Custom Layouts. I’ve submitted a PR to your widget repo to fix the issue @Steven mentions. I have some question about your widget. I know what these codes do but I don’t know where how to modify these codes. I know what is className(used for CSS) and label and rawLabel(used for translation)(if I am wrong please tell me) but I don’t know where should I find all other actions for button and icons. what does the route and model do?what is link? Hey @Alavi1412, if I’m understanding you correctly, you want to modify the profile widget to add a button that allows the user to open the composer to create a new topic? Any button has two basic parts two it: the button element, and the button action. I think you already understand the button element part. As you say you’ll need to use the button widget with the appropriate classes, icon and label (note that the button widget doesn’t have a rawLabel, only a link does - go to the button widget file and search for ‘rawlabel’ and there will be no matches. Yes the ‘label’ requires a translation object). We’ll also need the button action, which refers to a method that handles what happens when the button is clicked. This is the process I would take to figure out what we need for both the button element and the button action. I suggest you follow these steps yourself, as it will help you understand other issues you’ll encounter. As always, the place we start is with the existing Discourse functionality we want to copy. In this case we start with the button in normal Discourse that opens the new topic compose when it is clicked. 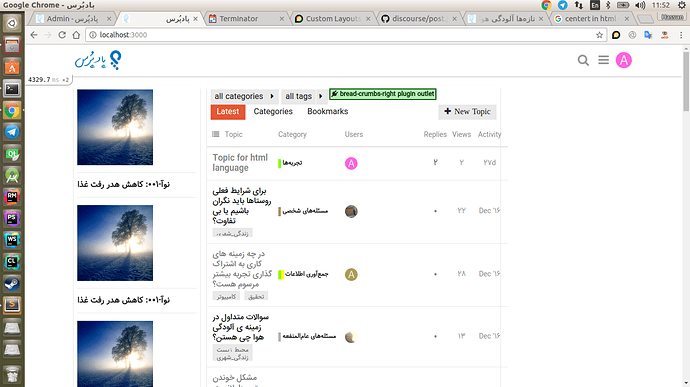 Go to meta.discourse.org and highlight the Create Topic button with the chrome inspector. You’ll see it has the id create-topic. How do we know which results are relevant? There’s often good hints in the name of the files. We know that the ‘Create Topic’ button appears in the same part of the app as the navigation controls, so it seems likely that the files with ‘navigation’ in the path are relevant. Those results also seem to be about button elements, which is what we’re after. 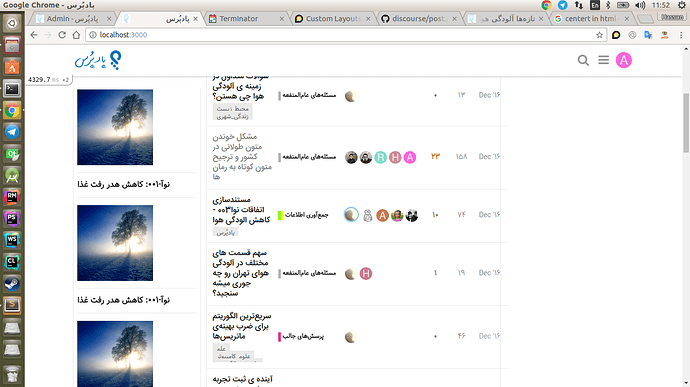 Once we add that button widget to the profile widget, we now have a create topic button in the profile widget. We’re half the way there. 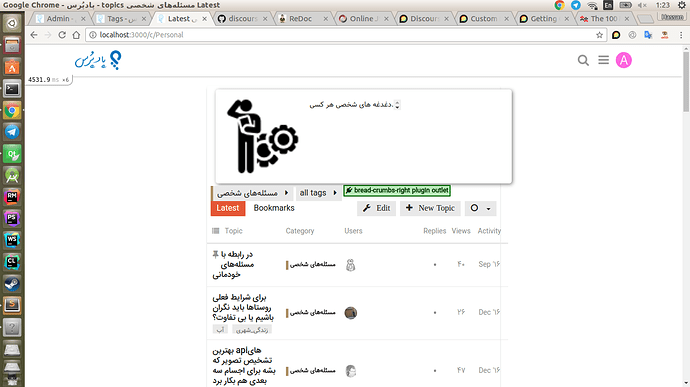 If you click that new button, you’ll see a message in the console createTopic not found. We need to deal with the second part of the button, the button action. If you’ve read the part of the Ember Guide that covers Template Actions, you’ll know that the action handler we got from one of those templates refers to an action method in a corresponding component, controller or route. So let’s just do a search for that handler and find the corresponding instance. Ok we’ve now found the method. How do we get that method to work for our widget button? If you’ve read A tour of how the Widget (Virtual DOM) code in Discourse works, you’ll know that each action in a widget needs a corresponding action handler in the widget. Ok, so let’s create a createTopic method in the profile widget that does the same thing the createTopic method in the Discovery Route does. If you follow where the openComposer method in createTopic in the Discovery Route comes from (or open any of the other results in our search for createTopic methods in the codebase) you’ll figure you that what we need to do is send an ‘open’ action to the composer controller with the right parameters. So we need to access the composer controller in our widget action. The createTopic method in the discovery route also uses the discovery/topics controller, so we’ll need that too. If you look at the other action handlers in the profile widget you’ll see how they access controllers and routes from the widget. i.e. Using this approach we can now make our own createTopic method. Once you add that new createTopic method and reload, your Create Topic button will now (mostly) work like the Create Topic button in the normal Discourse discovery. The composer will open. There are some issues that arise by virtue of the fact that the profile widget can appear in different contexts from the context in which the normal Create Topic button appears. Start with what you already know. We know that there is a button in normal Discourse that does what we want to do. Start by figuring out how that works. Copy as much as possible. We can copy from both normal Discourse and the existing code in the profile widget that does similar things to what we want to do. Using this approach the answers you get will not be 100% perfect, but they will get you 90% of the way there. Once you’re 90% there you have a much better idea of what the 10% of actual problems you’ll need to figure out are. I have to get back to work now, so I’ll leave those other questions with you for now. Apply the same approach and see if you can figure out the answers. one part of my widget is at the bottom but because of the height it is not shown even after scrolling. Yup, there’s a setting for that actually. Check Settings > Plugins. Have you enabled the sidebar on category pages? You can enable the sidebar either for all category pages in the admin plugin settings or you can enable the sidebar and widgets for specific categories in the category settings. Yes I have done this.but nothing is shown. Ah, you mean the sidebars are not working on the tags index page? 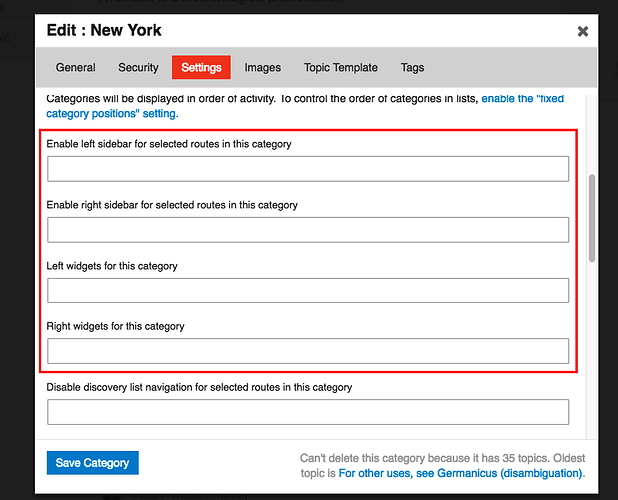 I’ve added sidebar support to the tags show route. Let me know if that solves your issue. changed 5 files with 81 additions and 1 deletions. my widget didn’t show here. The problem is that you’re trying to convert the attrs object to a JSON string and it’s failing. This exception is preventing the sidebars from loading on category routes. Let me know if you need any help with the rest of it. where should I find something like this? thank you bot I didn’t mean than. I mean where should I find a reference of something like Discourse.Category.list(). For example can I get received_likes with just one line code with this? 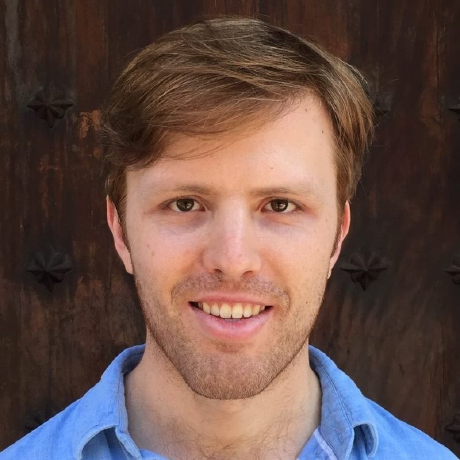 I have another question, what is the problem with ajax? Whenever you see the discourse namespace being used in this fashion in the client, it means that the method can be found in the relevant model file. In this case, you will find the Discourse.Category.list() method in the Category model file, here. You’ll see that that method refers to the property categories on the Site model (Site is a singleton - i.e. there is only ever one instance of it - and the method currentProp is just a method that lets you get a property from a singleton model - see here). The categories property on the Site model is kept updated from the server by a message bus subscription in an initializer - see here. This subscription subscribes to data on the server when the app initializes and gets updates when the data on the server changes. When the categories subscription receives data, it updates the categories property on the Site model using the updateCategory method. The server side of the message bus subscription is here. As you can see, it serializes (i.e. “sends one after another”) the categories (i.e. “self” in the Category model) to the server as JSON. If you want to see another example of a plugin using the message bus to push data to the client, see here in the topic ratings plugin. That publication pushes ratings data to all clients when one user adds or creates a rating. You could use your own ajax call in this scenario if you want. However, generally it is a good idea to try and re-use as much existing core discourse infrastructure as possible. You’ll save a lot of time and energy (perhaps not initially but definitely over time), you’ll understand more about how Discourse works and your work will be better able to keep up with changes in the Discourse codebase. Firstly, before you go trying to get data from the server, check if the data is already available on the client. If its data about the user, a category, a topic list or even a topic, you may already have it on the client and there is no need to add a new call to the server. Furthermore, if you want extra data about a model you already have on the client, e.g. the user, normally the best way to get that is to add that extra data to the serializer that is already serializing that model to the client. It’s a bit like calling your friend and asking them to pick up something extra from the supermarket while they’re there, rather than going to the supermarket for that one thing yourself. I can elaborate on how to add data to an existing serialization separately. Ajax call. You can call any get route the server already has set up - see the server route file here, or you can create your own get route in a plugin - see here for an example of how to create a new route in a plugin. Message bus. See previous post for an example of how the message bus works. To see what other message buses you can subscribe to, just do a search for MessageBus in the server code. If the route or message bus subscription is not already available, you’ll have to create it in your plugin.rb file.